Drake fans listen up! 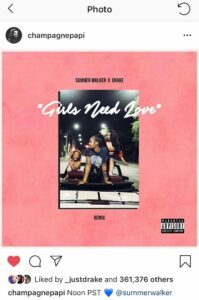 The Atlanta-based R&B singer Summer Walker just released the remix for her hit song “Girls Need Love” and “Drizzy” Drake is on the track. “Girls Need Love” had already been known as a popular song on Summer Walker’s 2018 project titled Last Days of Summer with over 30 million views Youtube and 35 million streams on Spotify. Summer Walker has also built up the song’s platform by performing “Girls Need Love” on Jimmy Kimmel Live! We could start with a handshake baby. "Girls Need Love (Remix)" is a beautifully articulated song and, with Summer Walker having Drake featured on this track, the song may reach even higher heights on the hip-hop and R&B charts this year. 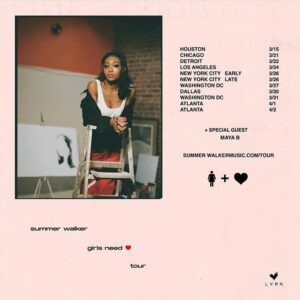 Fans of the Summer Waker can look forward to the Girls Need Love Tour in North America touching down on cities such as Houston, Los Angeles, and Atlanta.